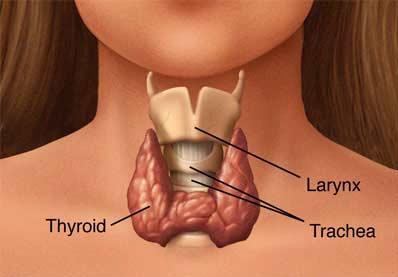 The thyroid is a butterfly-shaped endocrine gland usually located in the lower front of the neck below the larynx (the voice box). The thyroid's job is to make thyroid hormones, which are secreted into the blood and then carried to every tissue in the body. Thyroid hormone helps the body use energy, stay warm and keep the brain, heart, muscles, and other organs working as they should. The main hormone made by the thyroid is thyroxine. Hypothyroidism is a kind of thyroid disease. In people with hypothyroidism, the thyroid does not make enough thyroid hormone to keep the body running normally. Who are at high risk for thyroid disease during pregnancy? In such patients screening is required for hypothyroidism. What is the interaction between the thyroid function of the mother and the baby? Baby is dependent on mother for the production of its own thyroid hormones. 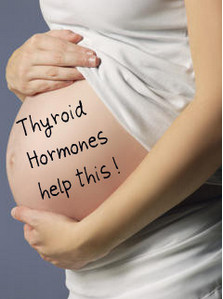 Hence hypothyroidism in mother can effect baby growth. 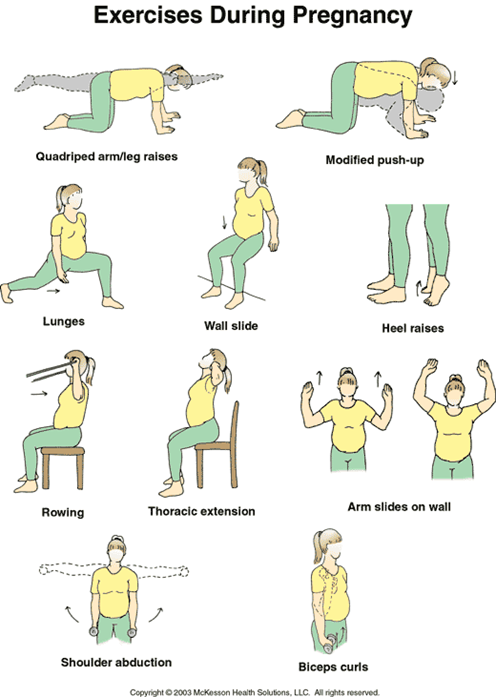 Treatment for hypothyroidism during pregnancy. It involves adequate replacement of thyroid hormone in the form of 'thyroxine'. Thyroxine requirement increase during pregnancy often by 25-50%. You have pain, redness, and swelling in your muscles and joints. You do not have any more thyroid medicine, or you stopped taking it without your caregiver's advice. You faint or have a seizure. You feel your baby is restless and always kicking, or is very still and not moving at all. You have sudden chest pains or trouble breathing, or swelling in your legs, ankles, or feet. You have diarrhea, tremors, or trouble sleeping. Your water breaks, or you are bleeding from your birth canal. Your signs and symptoms return or become worse. After a change in your thyroxine dose, you will need to have your TSH checked after 4 weeks. You may need tests more often if you are taking a medicine that interferes with your body's ability to use thyroxine (like vitamin tablets containing calcium or iron supplements, or antacids that contain either calcium or aluminum hydroxide). Consequently, levothyroxine and pre-natal vitamins should not be taken at same time and should be separated by 2-3 hours. The goal of treatment for hypothyroidism is to get your TSH in the normal range and keep it there. Try to keep active on a daily basis; half an hour of walking each day can be enough, but if you can't manage that, any amount is better than nothing. If you go to exercise classes, make sure your teacher is properly qualified, and knows that you're pregnant and have thyroid disease. You might like to try swimming because the water will pools provide aqua-natal classes with qualified instructors. Two categories of foods have been associated with irregular thyroid hormone production. The second category is cruciferous vegetables including broccoli, cabbage, cauliflower, and turnips. Choosing iodized salt - salt supplemented with iodine - over plain salt and prenatal vitamins containing iodine will ensure this need is met.